The world's oldest works of art have been found in a cave on Spain's Costa del Sol, scientists believe. Six paintings of seals are at least 42,000 years old and are the only known artistic images created by Neanderthal man, experts claim. Professor Jose Luis Sanchidrian, from the University of Cordoba, described the discovery as 'an academic bombshell', as all previous art work has been attributed to Homo sapiens. 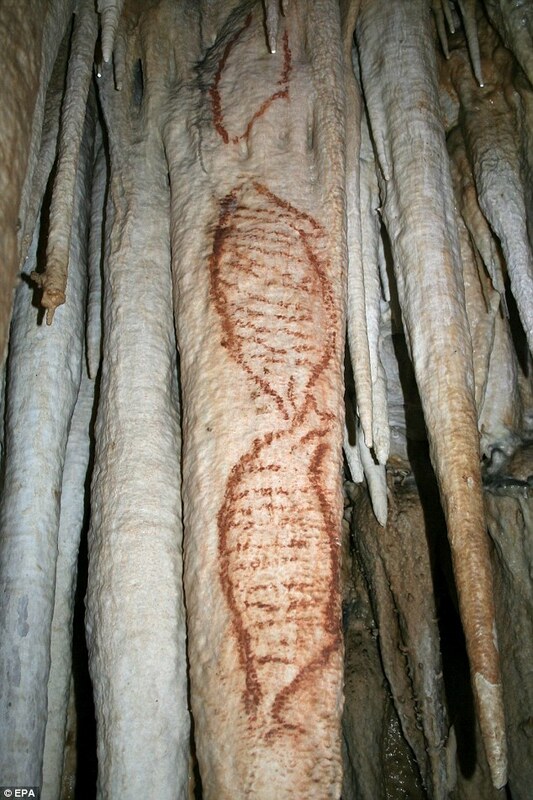 The paintings were found in the Nerja Caves, 35 miles east of Malaga in the southern region of Andalusia.Spanish scientists sent organic residue found next to the paintings to Miami, where they were dated at being between 43,500 and 42,300 years old. Not sure whether this has been (or will be) published elsewhere, or what is the evidence, exactly, that this art was made by Neandertals. 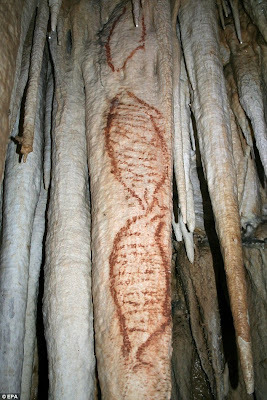 If the date is correct, it is certainly a spooky coincidence with the appearance of the first modern humans in Europe. UPDATE (Feb 23): A more detailed story from the New Scientist. 2. sapiens arrives to europe via gibraltar, but it is very strange because neanderthals live in the area from gibraltar to malaga 40.000 years ago. If we admit that sapiens was made paintings in nerja cave we need to admit that the europe colonization was made by the southern route via gibraltar. And we have a problem, because Neanderthals live in a big area from Gibraltar to Malaga 40.000 years ago; we have in malaga ((zafarraya 18 kilometers from nerja cave, we have neandertal remains, we have bajondillo, la araña, palomas in teba,all of this only in malaga)) and in andalucia (for example la cariguela in granada) a lot of mousterian settlemets for this date , and we do not have any sapiens or aurignacian settlements 40.000 years ago in the south of iberian peninsula. If the dates are right, i think the better option is neandertal rock art. Why didn´t human paint neanderthals (nor neanderthal humans) if they met each other? They paint all kind of animals and never painted each other? Am I wrong? I don't beleive that I would be able to distinguish between a rock painting of a Neanderthal and a Homo sapiens. I am not sure I would recognize a neanderthal as different if he walked past me in the street. There aren't many paintings of people anyway, and perhaps Homo sapienes did not see them as a different species. Interbreeding was clearly possible, so technically they weren't a different species. Near as I can tell paleo-humans only bothered to paint cool stuff. Not their every day smelly brothers and next door neighbours. Do these really look like seals? Perhaps a glimpse of a dolphin or something similar as it swam past at speed? Striped seals? Plus the shape looks wrong for the bigger two at least. I am thinking someone saw an unsual marine mammal of some kind and was influenced by his/her knowledge of seals. If we admit that sapiens was made paintings in nerja cave we need to admit that the europe colonization was made by the southern route via gibraltar. No - we don't. In addition to Eastern (and likely Central) Europe, AMHs lived in northern Italy and in France at about that time. Albeit still a bit controversial, most recent research indicates that the transition cultures in Italy and France are actually not Neanderthal - they just look a bit atypical for AMHs because of different exploitation patterns of the first pioneers. Interesting find. I would love to hear more from experts and non-experts alike as the research continues. It is aweseome and mind blowing if that's true. Nothing in the article itself provides anything other than the age to associate the find with Neanderthals as opposed to modern humans, and I agree with Dienekes that the date is far to close in time to the arrival of the first modern humans in that vicinity. Annie Mouse also makes a good point. Since when do seals have stripes as a defining visual feature (dolphins don't either)? But, many coastal Mediterranean fish used by modern humans but not Neanderthals as a major food source do have the shape and visually defining feature of stripy-ness seen in those images which look a lot like other Upper Paleolithic modern human paintings and have no Neanderthal precedents. Given the extraordinary claim it requires extraordinary evidence, and the limited utility of flint tool character to distinguish modern humans from Neanderthals ca. 42,000 when AMHs had pretty primative tools too, and the lack of any convincing statement of reasons to call it a Neanderthal rather than AMH origin painting does not reach the level of extraordinary evidence. I wonder if they could be beaked whales. "I saw something cool in the water"
"Probably a seal, did it look like this (smaller seal like drawing)"
"No, it was bigger and had stripes, more like this (larger painting), no thats not quite right , more like this (more detailed painting)"
From my perspective as a non-specialist in this field, this is potentially the most important post I can remember on this blog. In particular, for those who want to posit a sharp division (in every age) between human and animal, Neandertal art poses the problem of whether to say that sophisticated art can be produced by animals, or whether to say that some Neandertals were human. I suspect that most contributors here would deny that such a sharp division between animals and humans has always existed (I'd be interested in the straw poll). But I suspect the majority of the world would believe in a sharp division between human and animal in every age. If so, the majority of the world is potentially presented with a tough choice by this data: Animal art, or Neandertal humans.